Last night I viewed the 2005 film Good Night, and Good Luck. The movie was directed and co-written by George Clooney and was nominated for six Academy Awards. Remarkably, it was made on a budget of only 7.5 million dollars. It tells the true story of a pivotal incident that occurred during the McCarthy era, and how journalist Edward R. Murrow took the bold step to directly expose U.S. Senator Joseph McCarthy and the rogue activities of his anti-Communist subcommittee investigations. The movie is seamlessly integrated with archival news footage of Joe McCarthy and his public interrogation techniques. Subsequently, his actions have been revealed as one of the low points in American history. The movie is about the era of the Communist "witch hunt" and in particular about the chilling impact it had on the lives of people working in news industry at the time. Good Night, and Good Luck begins and ends with a reenactment of Murrow's important 1958 speech before the Radio and Television News Directors Association. In it, he challenges broadcasters to invest more heavily in public service and hard programming, even if it is not as profitable as game shows, soap operas, and light variety show entertainment. Murrow, a veteran radio journalist who reported from London in WW II, saw great potential in the new medium of television, but felt that it was headed in the wrong direction. In the end, Murrow's dire warning was not heeded. American broadcast television evolved into a wasteland of cheesy commercials, mindless light entertainment, and a never-ending sea of superficial fluff. It was interesting to view the movie from the perspective of someone who was born right around the time that it transpires (early 1954). The watershed events of the McCarthy era would mark American history and the public consciousness for decades to come. It was also interesting to take in the details of the background context of the film: notably the music, culture, and ambiance of life in NY city at that time. Good Night, Good Luck was released in black and white, and this effect reinforces the look and feel of the 1950s. Everybody chain-smoked in those days - both on the air and in front the television camera. The decorum of the 50's modern NY office building in the set design was right on the mark. In 1954 CBS (which derives from Columbia Broadcasting System) had their radio, recording, television studios and administrative offices in New York. A replica of CBS's Production Center was the primary set for the movie. The iconic CBS logo at the time was an abstracted "eye." In the movie, William S. Paley (Chief Executive of CBS) is played by actor Frank Langella. There is an interesting scene where Murrow (played by David Strathairn) is riding on the elevator. The door opens, and his boss William Paley enters into the elevator from another floor. You can see in the background behind Paley that he is entering from the Columbia Records floor of the building. In reality, Paley must of had to walk a difficult line of supporting projects underway by his senior staff while at the same time finding the funding for them. Murrow and his news division were losing money, since one of his key advertisers (Alcoa Aluminium) had threatened to pull out. In fact in 1955 Alcoa did sever its sponsorship of Murrow's show, but continued to sponsor a more patriotic program called "Modern Farmer" which I clearly remember seeing as a child early in the morning. Similar financial pressures must have existed in the Columbia Records division too. The brief incidental scene in the movie where CBS Chief Executive Paley departed the floor where the offices of Columbia Records resided perked my interest. In reality, he surely had "budget" and "strategy" meetings with Goddard Lieberson who was appointed as President of Columbia Records in 1956. Lieberson (father of composer Peter Lieberson) was married to Vera Zorina, the well-known ballerina and movie actress (I've met her). 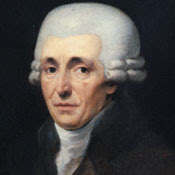 Lieberson was a composer himself and a strong supporter of classical and modern music at Columbia. He supported large-scale projects, such as the recording of the complete works by Arnold Schoenberg, Anton Webern, and Igor Stravinsky. He also created the genre of the Broadway cast album. Lieberson was a technical innovator too. Working with CBS Labs, he introduced the 33-1/3 rpm Long Play (LP) vinyl disk format, which competed directly with RCA Victor's 45-rpm standard. In later years Lieberson would introduce Stereophonic recordings to the consumer market. I can imagine Lieberson trying to walk the tightrope between his boss (William S. Paley) who was concerned about the bottom line, while keeping his "prima donna" classical recording artists (e.g. Igor Stravinsky, Glenn Gould, and Lenny Bernstein) in check. The CBS logo was integrated into the Columbia Records icon by art director and designer Neil Fujita. He created a logo for the record company that became known as the "Walking Eye" (shown on the right). Although none of this history regarding Columbia Records is in the movie, it was part of William Paley's legacy at CBS, and hard for a musician to ignore or disregard. Paley was also an advocate for modern painting, and contributed financially to New York's Museum of Modern Art (MoMA). Perhaps the most powerful part of the film Good Night and Good Luck is documentary footage of Annie Lee Moss. She was was a low-level communications clerk working for the U.S. Army at the Pentagon. She was an average person who started working for the government in the cafeteria kitchen, but was singled out and accused by Joe McCarthy for being a Communist. An FBI agent had infiltrated the American Communist Party and saw her name on a list. Up to this point, the public had not fully witnessed McCarthy's harsh methods of interrogation, but Murrow used his television program to expose McCarthy for what he was: a big bully circumventing the normal process of law. The late 1950s were probably the best years at CBS, but their quality of product and moral integrity gradually rolled down hill from there. The slippery slope of mindless fantasy TV began in 1954 with new TV series such as "Father Knows Best" and "Lassie." The public wanted the easy comfort of the Ed Sullivan variety show rather than hard-hitting news or avant garde music. This numbing form of escape broadcast into our homes helped us to forget the Cold War and the ever-present threat of nuclear annihilation associated with it. Unfortunately, the trend of "dumming down" continues today with game shows, reality TV, and "American Idol." Columbia Records was sold off by CBS, and is now a subsidiary label of Sony Music Entertainment. Both thoughtful journalism and the arts are difficult products to sell. They don't make a lot of money, are generally expensive to produce. More often than not, they require the an infusion of cash or subsidy from a not-for-profit organization. CBS under Paley's leadership provided support and vision to his friends and senior executives. Both Murrow and Lieberson had some leeway to explore - at least for a time - what was worthwhile and noteworthy. But ultimately the financial axe fell on both divisions at CBS and elsewhere in corporate America. Money, I'm afraid, is more powerful than ethics. It's fundraising time again for public radio station WGBH. The station closes its fiscal books for the year tomorrow at midnight, and this week they have been in high-gear selling last-minute online memberships with various enticing promotions and incentives for those who contribute. I support them, but their fundraising campaigns do irritate me to no end. Please renew your membership so that the endless fund raising blabber will cease! Franz Joseph Haydn (1732-1809) composed his pianos sonatas, so the pianist Marc-André Hamelin could record them, so that WGBH can offer his CD to you as a gift with your WGBH membership. It's the ecological food-chain concept: Small fish (composers) eat plankton and invent great music, which bigger fish (performers) feast on. Even larger fish (public radio) consume them, and finally the king of the ocean (the public) is nourished from among the largest of fish in the food-chain. Each step along the way adds additional value, until at the end you have a marketable consumer-ready product, like Micky D's McFish Sandwich. 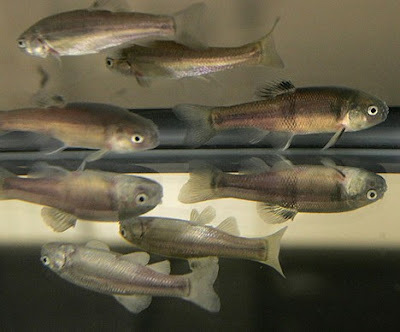 Interesting concept, but I have trouble thinking of Franz Joseph Haydn as a minnow waiting to be swallowed up en masse along with other tiny fish in his school. Are composers really at the bottom of the food-chain? For some reason, as I listened to the amazing sounds coming from keyboardist-composer Dave Bryant and his band Thursday evening at the Outpost 186 in Cambridge, I felt the presence of Adorno. Theordor Adorno (1903-1969) was a German-born philosopher, musicologist, and composer. He was an advocate of modernist music. He was part of Schoenberg's circle, and studied music composition with Alban Berg. He was not a fan - at least initially - of American music. In 1936 he scripted an infamous essay for the journal Zeitschrift titled "On Jazz" ("Über Jazz"). Adorno viewed the United States as a cultural wasteland in which people's minds and opinions were formed by "the music of slaves." Über Jazz was a polemic against the influence of the commercial entertainment industrial complex. Popular music was in his view the product of a repressive system by which record executives exercised total control over the market and dictated to society in precise terms what it should consume. According to him, pop music standardized culture and created a commodification of artistic expression. In a nutshell, Adorno thought that American music is the "worst of worst" of commercial inventions, designed solely for the purpose of profit and financial gain. If Adorno could have been there last evening, I think he would have changed his views about American jazz. Watching Dave Bryant perform with his collaborators was inspiring on many levels. It is complex. It is largely improvised, and it is as rich and rewarding as any work of fully-notated new music that we might hear in concert at a classical music venue. It is art music. It is also non-commercial, uniquely American. Most important, it stems from - and is inspired by - "the music of slaves." Adorno was flat out wrong, at least about American jazz. Assisted by Tom Hall on tenor sax, John Voigt on electric string bass, and Eric Rosenthal on drums, Bryant has devised a system of musical expression that captures the energy of the universe and redirects it back to the listener with laser precision and expressive clarity. He manages to put order to chaos, and uses chaos to create larger structures of musical form. Before the musicians sat down to begin their initial set, one of them joked about the NASA-like configuration of Bryant's synthesizer equipment. They wondered if he would be exploring the rings of Saturn. Then everyone plugged in, turned on their amps, and blasted off. The set began with the tune "Sleeprunners." Bryant started off with an introductory solo which rapidly shifted gears between divergent modes and key centers. Then drummer Eric Rosenthal injected a grid of incisive rhythm, and the band was off. Tom Hall really ripped on his tenor sax solos, drawing upon synergistic energy from his fellow band members. Hall has performed with "Your Neighborhood Saxophone Quartet" and "Club d'Elf". He is a long-time friend of Bryant, but this is the first time they have collaborated musically. Bassist Jon Voigt is a musician that I first met at Berklee in 1973. Back in those days he had a split personality: On one hand he was a soft spoken and mild-mannered music librarian wearing a black turtle-neck sweater. On the other hand he was a raving avant garde-inspired musical anarchist subversively plotting revolution. He was one of the few people at Berklee who understood where I was coming from and sympathised with the aesthetics of new music - in all of its constantly evolving guises. Jon volunteered to play bass in a piece of mine, but unfortunately I had second givings about its' musical value after conducting the first rehearsal, and canceled the scheduled performance. He was a good sport about it. Now retired from Berklee after nearly 30 years of library work, Voigt is hitting his musical stride. His bass playing is simply awesome. Watching Voigt in action, I noticed that his right hand often attacks his instrument like a crazed spider on LSD. His rapid-fire arpeggios and walking bass action provide both support and inspiration to his colleagues. I was shocked to learn that Voigt is 70 years old. It's impossible. They guy is a walking repository of Beat-culture and a staunch ambassador for the merits of artistic chaos. It's an honor to be in a room with him. Dave Bryant, the leader of the pack, is a certified bebop-on-steroids player. At least two of the tunes the group performed in the first set are featured on his CD "The Eternal Hang." It's available commercially on Accurate Records (AC-5035) and can be digitally downloaded from Amazon. Bryant is a unique musical phenomenon, and has to be seen to be believed. He finds the notes to play, real time, from within - and rarely plays a wrong one. I have no idea how he does it, shifting between several different planes of musical discourse while interactively cherry-picking the best ideas from each. You can hear elements of traditional jazz interspersed with 20th and 21st century harmony, cross-references, internal associations, embedded quotations, and occasionally a light-hearted digression of playful doodles. Bryant developed his chops over the course of a decade playing in Ornette Coleman's band Prime Time. He continues to bring music to new levels, and is constantly exploring the range and possibilities of free jazz. After the ballad "Little Back Dress" (also on the Accurate Records CD) the band ended the first set with Bryant's tune "Years Per Minute." He got the title from an old EC Comics science fiction story by Harvey Kurtzman, and it was fast. Really fast! "Years Per Minute" was transcending. It took me to places that I didn't know existed. As my life flashed by in front of me at warp speed, I thought, "Adorno, are you listening?" The Outpost is located at 186 1/2 Hampshire Street in Inman Square, Cambridge (follow walk on left to the Gallery in back). Dave Bryant is scheduled for a return show at the Outpost on Monday September 14th at 8 PM ($10 or B/O). I last saw him on May 10th when his beautiful work Kohtlyn (2000) was performed by soprano Jennifer Ashe and trombonist Will Lang at a concert organized by the Boston Microtonal Society. Composer, theorist, reedsman, poet, and educator Joe Maneri died on Monday August 24th at the age of 82 of heart failure. His presence on the music scene will be sorely missed. Lee Mergner of the JazzTimes wrote (8/27/09), "For most of his life Maneri toiled in obscurity, spending his time as both a student and teacher of creative music." 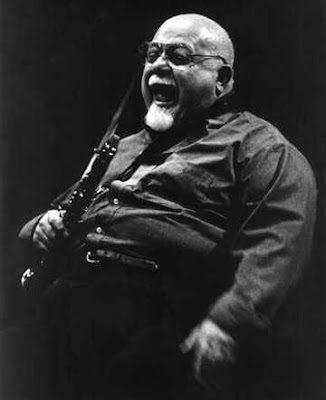 In 1995 Ran Blake said of his colleague at the New England Conservatory, "Joe Maneri is one of the 20th century's greatest clarinetists." What I find amazing about Maneri's career is how he worked in so many different musical genres. Jazz enthusiasts will know him from his early work with Gunther Schuller's 20th Century Innovations Ensemble performances of "Third Stream" music at Carnegie Hall. Schuller had arranged a record deal for Maneri with Atlantic, but the 1963 recording was not released by the record company. In 1988, the Atlantic recording session tapes were made available to the Avant label and released under the title "Paniot's Nine." In the 1990's Joe Maneri released 14 additional attention grabbing albums on the ECM, Hat Hut, Leo labels, often in collaboration his his son Mat - a free-style violinist/violist. He taught many students the art of composition, often using Arnold Schoenberg's harmony and counterpoint books as his method. One of Maneri's notable music students is the prominet composer Richard Danielpour (who I knew from my days at NEC). As a composer, Joe Maneri was mostly self-taught. He dropped out of school in the eighth grade - perhaps because of an undiagnosed attention deficit disorder - but went on to develop his musical abilities with intense private study. He studied the works of Stravinsky, Schoenberg, and Webern under the tutelage of Josef Schmid (a student of Alban Berg) over a period of ten years. His compositions were featured at Carnegie Recital Hall in 1961, including his "Divertimento" for piano, drums, and double bass. Maneri was hired to teach 16th-century counterpoint and music composition at the Brooklyn-Queens Conservatory of Music in NY, and it was there that he met Sonja Holzwarth, whom he later married. From 1970-2007 was on the faculty at the New England Conservatory in Boston. He was very active organizing concerts of new music during his tenure at NEC. Joseph Gabriel Esther Maneri was awarded an honorary doctorate from NEC in May of 2009 for his lifetime of work in the field of music. Maneri composed for a time in a pointalistic serialist style. Robert Ceely, a Boston Composer and colleague of Maneri at the New England Conservatory recalls watching pianist Zita Carno at Tanglewood sight-read through Maneri's piano concerto Metanoia. Carno played both the piano and orchestral parts, which was an accomplishment since Maneri's concerto is rather complex. 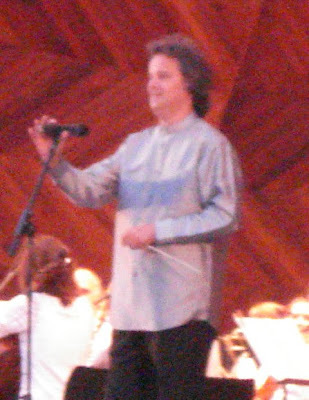 The piece was commissioned by Boston Symphony Orchestra music director Eric Leinsforf, but never performed by them. However, in 1985 Metanoia did receive its' long awaited premiere performance by the American Composer's Orchestra at Alice Tully Hall in NY. The piano soloist with the ACO was the late and great new music advocate, Rebecca ("Becky") la Brecque - who died much too soon. 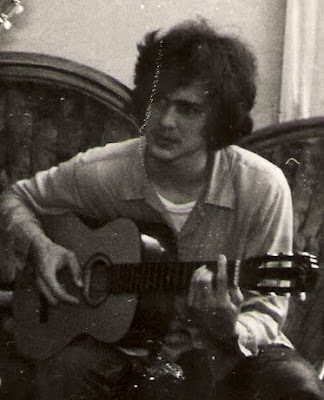 Returning to his Sicilian roots, Maneri became interested in European folk music, particularly that of Eastern Europe. The microtonal inflections of Greek folk music fascinated him and led him on a new path of musical exploration. Joe Maneri began composing with the 72-note scale developed by his colleague Ezra Sims. His microtonal improvisations and composed pieces are remarkable. As a dedicated teacher and co-founder of the Boston Microtonal Society, Maneri inspired a whole generation of composers to work in the microtonal system. He invented a keyboard the had 588 notes: 72 pitches per octave. Maneri is co-author (with Scott Van Duyne) of a theory book titled "Preliminary Studies in the Virtual Pitch Continuum." I understand that a private Roman Catholic funeral will be held for Maneri this morning in Framingham, and that a public memorial service and concert will be scheduled for the future. He is survived by his wife Sonia, five children, and eight grandchildren. His presence as a musical force and teacher in Boston will be missed. For those of you who live in the New York city metro area, you are in luck. She will be performing in recital on Tuesday September 8 at the Mannes College of Music in a program of American violin music. It is part of the Transit Circle concert series. Cuckson will be recording the Shapey and the Hersch later this year to add to her growing number of released CDs. "It's an intense program, one that may seem very serious, but I find each of the pieces a wonderfully immersive experience in the composers' worlds, and they are full of drama, vitality, color and emotion. They also present interesting ideas about the interaction of gesture and time, and pose the kind of engaging instrumental issues that I really savor." The concert is at 8pm and if you are on a restricted budget, you'll be glad to hear that the concert is free! Mannes is at 85th between Columbus and Amsterdam. Can't make it to NY? If you visit Miranda's MySpace page, you can listen to a variety of musical excerpts and download a cool ring tone: such as Don Martino's Solo Sonata. Now, that's beyond cool! What could be better than spending a hot summer evening in Boston strolling along the Charles River? 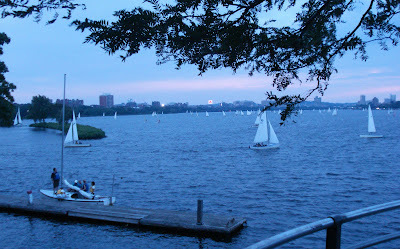 The sailboats from Community Boating are a fixture along the Charles River basin. Frederick Law Olmstead helped to designed it. Walk a short distance, and you will find your way to the DCR Hatch Shell on the Esplanade. The construction of this outdoor music shell took place in 1941 with a $300,000 donation by benefactor Maria Hatch as a memorial for her brother Edward. 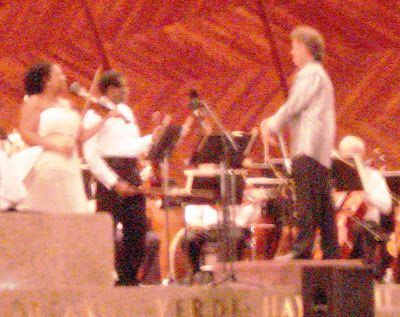 Here is a photo of the Boston Landmarks Orchestra (Charles Ansbacher, Music Director) performing a program of Mendelssohn and Mozart on August 26, 2009. The guest conductor is Hobart Earle. The program included the Mozart "Jupiter" symphony, but unfortunately the sky was not clear enough Wednesday evening to see Jupiter. 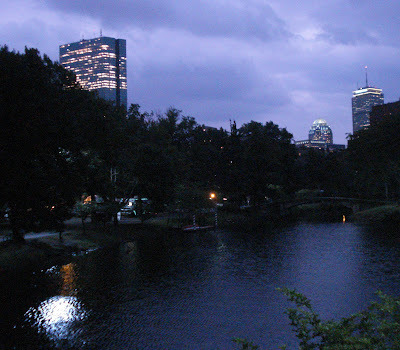 The water glistens as the Boston skyline is viewed at night from the Esplanade. 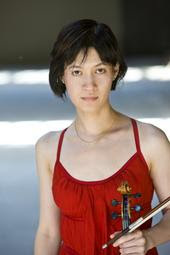 Violinist Mariana Green-Hill and violist Marcus Thompson performed the Sinfonia Concertante in E-flat by Mozart (photo above). I marveled in their joint cadenzas. They seemed to have the same idea about how it should go. 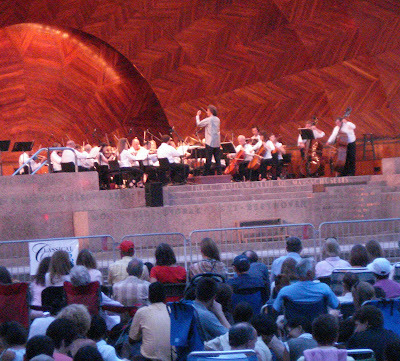 The Boston Landmarks Orchestra performs throughout the summer at the Hatch Shell and at other venues in Boston. Their next concert is on September 2nd at the Hatch Shell with a world premiere by Boston composer Thomas Oboe Lee. Lee is among the first composers I first heard when I arrived in Boston in 1973. His very first opus, a String Quartet, was performed in the"contemporary art room" at the MFA. It was one of the works in a new music series run by Rodney Lister and Conrad Pope called "Music Here and Now." Thomas Oboe Lee comes from a musical family, and all of his siblings were given a middle name that corresponds to a musical instrument (I think his sister may have been named "Clarinet"). Tom, perhaps in protest, became a flutist. The new Thomas Oboe Lee work that will be performed in a few weeks is his third Boston Landmarks Orchestra commission. Over the past seven years, the orchestra has performed and recorded 14 musical works, including pieces by Tolib Shahidi, Julian Wachner, Michael Weinstein, Jeremiah Klarman, and Stephen Feigenbaum (2x). Let's hope that the Landmarks Orchestra keeps maintains their policy of supporting the creation and performance of new music. 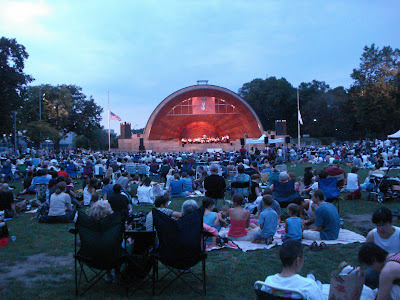 The DCR Hatch Shell is not the ideal situation for listing to music, since airplanes and helicopters will fly overhead, but you can't beat the ambiance or the price of admission. For those who prefer a little more luxury, comfy lawn chairs can be rented from the staff of the Landmarks Orchestra for $5. 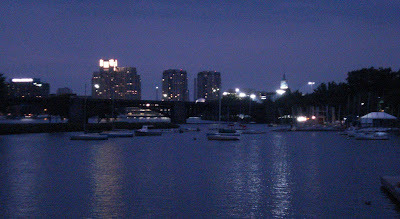 A view of the Cambridge skyline and the Longfellow Bridge as seen from the Esplanade. Here, guest conductor Hobart Earle says a few words to the audience after the orchestra's fine performance of Mendelssohn's Overture to A Midsummer Night's Dream. He mentions that the composer was only 17 years of age when he wrote it. Earle is Music Director and Principal Conductor of the Odessa Philharmonic Orchestra in the Ukraine where he has held that position for 17 years. Visiting the Esplanade brought back memories from when I use to attend the weekly outdoor summer concerts by the Boston Pops when I was a student in the 70s. 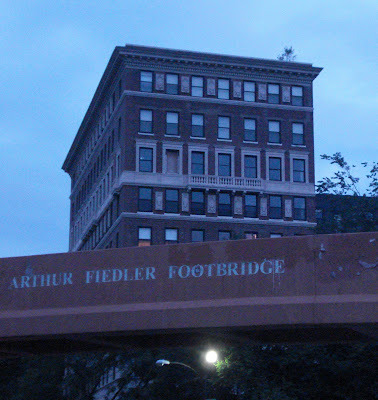 where Arthur Fiedler would conduct. Fiedler and the Boston Pops predated me by about a half century. He first performed on the Esplanade with the "Pops" in the summer of 1929. 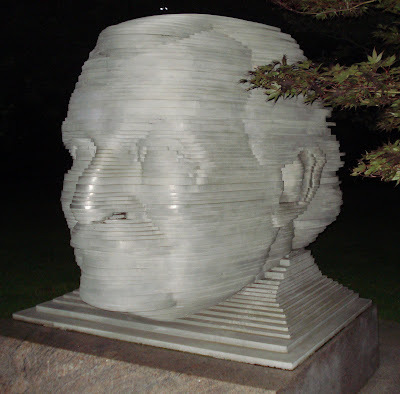 Before Keith Lockhart, before John Williams, there was Arthur Fiedler. The German-trained musician joined the ranks of the Boston Symphony Orchestra in 1915 as a violinist playing under Music Director Karl Muck. As a hobby, Fiedler would chase after fire trucks (yes kids, that's what we did before they invented the Internet). Fiedler died at his home in Brookline from a heart attack at the age of 84 following a performance with the Boston Pops on the 10th of July, 1979. Soon after Boston dedicated the foot bridge over Storrow Drive to his memory and erected a large iconic computer-designed memorial statue. 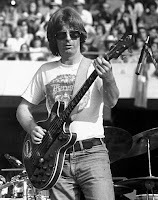 Rock star Phil Lesh (b. 1940) who played electric bass in The Greatful Dead for 30 years started out as an avant garde composer and free jazz musician. He studied with Luciano Berio at Mills College where one of his classmates was the minimalist composer Steve Reich. Lesh is still a big fan of new music. He befriended, supported (via his Rex Foundation), and interviewed the composer Elliott Carter in January of 1994. In 1991 the Rex Foundation subsidized a recording of Carter's orchestral music. Returning to his roots, Lesh conducted the Berkeley Symphony Orchestra in a performance of Stravinsky and Carter's "A Celebration (of 100 X 150 Notes)." 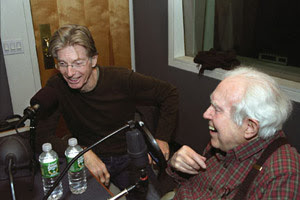 Just like me, Lesh made the pilgrimage to Tanglewood last July to attend the five-day Elliott Carter Festival. Oliver Knussen and the TMC Orchestra delivered a spectacular performance of Carter’s massive Concerto for Orchestra, and Lesh reportedly dropped by afterward to congratulate the bass section of the orchestra. I guess that makes Phil Lesh and myself "Carterheads." 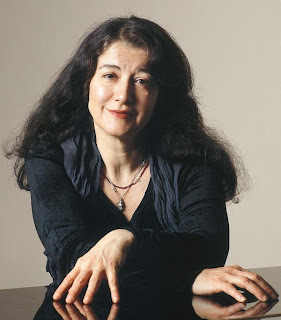 The Argentinean pianist Martha Argerich (b. 1941) is one of the great concert artists of our time. Although I've never heard her perform live, this past weekend I borrowed a DVD from the library. It's titled Martha Aergerich: Evening Talks, and is a 63 minute documentary film by George Gachot released in 2002 that delves into the life of this successful performing artist and explores her unique talent and history. While there are numerous musical excerpts throughout the documentary film, the movie is based around her informal commentary and responses to general questions regarding her work, ideas, and past. Argerich converses throughout the film primarily in French, but lapses into English occasionally to make a joke or speaks in German to communicate with the musicians she is rehearsing with. Of course, subtitles are provided. In the beginning of the film she describes the watershed moment where she realised she was destined to become a pianist. Although she had been playing piano since the age of three, her mother had brought her to a concert of the Beethoven 4th Piano Concerto. The section where Beethoven composed a cascade of piano trills moved her to tears. Interestingly, she has never allowed herself to perform that work for reasons of superstition. However, Argerich made her debut concert debut in 1949 at the age of eight performing Beethoven's 1st Piano Concerto. Beethoven has been an important composer in her broad repertory ever since. Argerich has kind words about her teacher Friedich Gulda. Her parents had moved to Austria so that she could study with him in Vienna. Gulda is said to have once met the jazz pianist Art Tatum and said, "Your music sounds like Debussy." Tatum then asked one of his jazz colleagues, "Who is that man?" The film is full of interesting moments, such as a rehearsal with the German conductor Jörg Faerber (b. 1929) and the Württembergisches Kammerorchester of the Schumann Piano Concerto. She is very adamant - particularly in the final movement - regarding nuances of phrasing and elastic variations in tempo. The documentary contains plenty of historical footage of her early years as a prodigy. Most of this relates to this or that prestigious international competition award she acquired early on. The good stuff in the film occurs when we hear her reveal present day confessions regarding a period of youthful self-doubt and artistic crisis. These stories are rather telling. For example, in her 20's she just spent a year or so just hanging out in NY, not playing the piano and "watching the Late Late show on TV." She had "lost her flame" for a period. We observe Argerich drinking Diet Coke in rehearsal and playing excepts of everything from pieces by the great Astor Piazzolla accompanied by a couple of jazz drummers to "Variations on a Theme of Paganini" (1941) composed for two pianos by the late Polish master Witold Lutosławski . (This piece and others can be heard in their entirety on the "extras" portion of the DVD which provides 38 additional minutes of musical performance from unpublished concerts and rehearsals). She really likes performing with other musicians and in concertos. You get the feeling that solo recitals are not much fun for her. Argerich seems to have a real affinity for the J.S Bach Partita #2 in C minor BWV 826. It is a piece that got her back to performing again after a period of inactivity and stage-fright. It's not a difficult work, but it is one that she can easily nail and break the ice with. She explained that her fear derives from the anxiety leading up to a performance, but once she is actually performing at the keyboard on the stage for an audience, she feels more in control. Included in the film extras for "Evening Talks" she performs the complete final movement of the Bach second Partita (#6 Capriccio) as an encore. Check it out. The following YouTube clip is not from the documentary "Evening Talks" but from a more recent 2008 performance of the Bach Partita at the Verbier Festival. Her performance is extremely convincing. In my view she seems to "own" the work, and has a natural ability to communicate the work's sheer joy. I particularly like the way that Argerich punctuates the score with jazzy accents to bring out her reading of Bach's architecture. Note how skillfully the theme emerges in her left hand in measure 19. I marvel at her articulation of the four-note jumping motive in the right hand of measure 3, and all of its subsequent appearances. The YouTube video starts with the performance in progress, at the repeat of the first section. Notice how in the middle of the second section Argerich plays softly until the strongly accented E-natural in the left hand of measure 80. By emphasising this particular note, the piece takes form. Argerich has had a rather complicated personal life and has dealt with serious health issues, but she now finds time to mentor younger musicians. If you can't get to a concert to hear her perform live, the George Gachot documentary Martha Argerich - Evening Talks will provide at least some insight. I will leave you with pure music. It's from another YouTube of Martha Argerich performing the third movement Ravel's Piano Concerto in G.
On Sunday, after cleaning up from the cookout/party the night before, I received a somewhat distressed phone call from composer Ezra Sims. He explained that his five-year old IBM ThinkPad computer is on its' last legs and quickly dying. No smoke yet, but the fan appeared to stop working and it was generating excessive heat. Sounding rather despondent, Ezra explained that he needed to get the notebook repaired or to purchase a new one ASAP. Frankly, he was in a state of panic and I could immediately relate to his feeling of helplessness. These days, a composer without a computer and Internet access is like a fish out of water. I suspect that the recent heat wave we have been having was a contributing factor as well. I hopped into my Honda and dashed over to his pad in Cambridge where we then strolled two blocks over to BestBuy at the Galleria Mall to see what they could do for him. His mission was to discuss his repair or purchase options with a representative of the "Geek Squad" and take appropriate action. My role was to function as his 3rd-party independent computer consultant, translator, and cultural ambassador. I think I was also summoned to act as psychological proxy, since buying modern technology is a daunting task for anyone. It's a major purchase for Ezra, and it involves change and lots of stress. As Ezra will readily admit, he is in his 80s and could benefit from assistance on some matters. He was concerned that he would have trouble relating to the 20-somethings from the Geek Squad, since the young people wearing the blue shirts on the BestBuy sales floor seem prone to ramble on in an unknown alien language. They are make assumptions about what you need, and jump to premature conclusions. Whatever the language, the Geeks talk rapidly and converse at a decibel level that is far too soft for Ezra to hear. Even in the best of circumstances it would be difficult to hear what they are saying over the blaring rock music the store pipes in through the public address system. First we brought his terminally ill notebook to the Geek Squad ER for triage. A nice Russian fellow delivered the grim news. It didn't have much life left in it, repairs would be expensive and "not virth it." Facing reality, Ezra decided to purchase a new PC. The Russian guy referred us to a young fellow with long dark hair who works on the sales floor wearing the requisite blue BestBuy polo shirt. We had a little trouble understanding the sales associate at first because of his tongue ring. The technical sales guy was very patient with us, and looked at Ezra in amazement as he explained what he needed a computer for. Ezra talked to him about the early days of computing at Marvin Minsky's original MIT Artificial Intelligence Lab, and about the one of a kind MS DOS-based microtonal sound synthesis program he would be using on the new notebook. Ezra is also dependent on the IBM "TrackPoint" pointer, and that narrowed down his selection. IBM ThinkPads are now manufactured in China by Lenovo, and the business division of BestBuy sells them online. The Lenovo product line is not available in the store, but the sales associate led us to a computer monitor where he looked up and displayed nearly 300 options and standard configurations. Ultimately, Ezra, the sales associate, and myself narrowed it down to a model that fits Ezra's modest budget. It comes with Windows XP and appears to have all of the features he will need. Ezra entered his customer information into the webpage at the store, and was told that the notebook will be shipped directly to his apartment. The next phase of this story will occur later in the week when I head over to assist Ezra in transferring his old programs and data from the dying computer to the new one. It will be interesting to see how easily that goes. This past weekend provided an opportunity to reconnect with some old friends that belong to the universe of composers. We had them over for a cookout on Saturday, just before the torrential rains passed through the area. The storm system was related to hurricane Bill, which did not make landfall, but passed by without major incident. Intense and tropical summer weather was the order of the day, and the heat and humidity remained in the atmosphere long after the heavy downpours. The composers at the gathering included John Watrous, Herman Weiss, Pasquale Tassone, Eric Schwartz, Armand Qualliotine, and myself. The accompanying "civilian" population included our beautiful, kind, tolerant, and sympathetic spouses as well as a mutual good friend Lora Martino. The common theme was that Lora's late husband Don had been our teacher at one time or another. Occasionally related and random teenagers would stop by to grab a hamburger and look puzzlingly at the assortment of people crowded onto our small deck behind the house. The old folks talked about violinist Rudoff Kolish, his Orgone energy collector, choral conductor Lorna Cooke de Varron ("Cookie"), and many other people or musical connections that are common between us. Renowned composer/orchestrator Conrad Pope dialed in with Skype from California to video conference with the us. He has been working hard as usual in that business. For the past 25 years or so, Conrad has labored around the clock and on weekends to meet deadlines for Hollywood movie productions. If you have been to see any movies in the past few decades, you have heard his soundtracks. The cookout was a success, and somehow I was able to manage being a host and the Skype video conference in addition to grilling chicken, hamburger, chicken breast, fish, and vegetables on a charcoal grill located well behind the house. We used a basket on a rope to periodically deliver the cooked (and over-cooked) food items up to the hungry composers waiting on the deck above. Everyone brought wonderful side dishes, and nobody went home hungry. do you know where your PII is? Personally Identifiable Information (PII) is a term used in information security. It refers to the various types of information that can be collected and stored in commercial databases about your identity and associated habits. Something as innocuous as an email address or Facebook ID can be used to uniquely identify who you are, and by implication it can be combined with other public and private data sources for even richer information stores. This morning I watched a number of assorted Web-Industry Executives appear as witnesses before a US House Commerce Subcommittee hearing regarding "Behavioral Online Advertising." The subcommittee is chaired by Representative Rick Boucher, a Democrat from Virgina. The industry witnesses included Christopher Kelly, the Chief Privacy Officer for Facebook and Nichole Wong, Deputy General Council for Google (which happens to be the application service provider of Blogger, host of this Blog). It's clear that many Internet companies provide a service that aims to gather as much information as they can about individuals, including their browsing and spending habits. Online data is often matched with off-line data, and this data is routinely marketed to third-party advertisers. While the "pie in the sky" upside to all of this data collection is that we will be more empowered as consumers, I have many reservations about the potential downside implications of this rapidly advancing technology. Perhaps Google and Facebook are more cognizant than most companies of the issues surrounding personal rights, but already we have a plethora of unscrupulous SpyWare vendors that indiscriminately gather vital information about us everyday. Privacy laws are not keeping pace with the technology. Since my blog is primarily about events and ideas in the area of new music, let me provide one example of how PII was recently used in a disturbing case that relates to the arts. In America we are all aware of the "American Idol" contest where fans select a winner by texting their votes to the program. In Europe, the televised song contest is known as Eurovison, and it's been around since the 1950s. It so happens that 43 Azerbaijani music fans texted their votes in support of this years' Armenian Eurovision entrants: a duo known as Inga and Anush. The musical duo sang the tune "Jan Jan."
Here is the evil part. Using the built-in capabilities of the communications technology, the Azerbaijan national security ministry located and called those 43 fans into headquarters for what was described as a "robust interrogation." The intersection between music and politics is nothing new, but the introduction of advanced technology into the equation provides certain elements of society with powerful tools to monitor and record our listening habits. While I have no interest whatsoever in the kitschy songs of Eurovision, the potential monitoring, control, and consequential loss of artistic freedom and musical expression is of great concern. Artistic censoring has happened in the past. It happened easily enough in a time when the capabilities of technology were not available as a tool of repression. Today, we are but a few mouse clicks away from being monitoring and categorized in terms of the kind of music we choose to listen to. In fact, this process is already happening. The databases are growing. Just beware that someday our musical preferences could come back to haunt us. For those of you that have a controversial or minority point of view in the world of music (or anything else), you have justification to be afraid. You never know what you will find on blogs, and this blog is no exception. My semi-regular readers (all three of you) have learned that deconstructing-jim is a place where you can come to learn about the trials and tribulations of the cruel and wacky world of contemporary music composition. It's about the esoteric and the banal as well as impressive accomplishments that occur in the field that receive little or no attention. Over the course of more than a year, these blog posts have served as inexpensive form of self-therapy, random conceptualizing, and recreational venting. This blog intends serve as an on-going document about the schizoid life of a self-described American composer, if that isn't anachronistic enough for you. My aim is to tell it like I see it: whether you are interested or not. Of course you can always tune out. "Serious" composers have often tried to emulate the success of their counterparts in the Pop music world by emulating their business practices. In today's environment, this means getting on the web. In the "old days" writing music was the main deal, and publishers and agents (if you were fortunate enough to have one) would handle it form there. Today, I'm told that musical artists of all types need to "webinize" themselves (not to be confused with "weaponize"). Besides writing the music, a successful composer needs to have a web page, blog, and be skilled at the art of Web 2.0 social-networking. This is the justification for my blog. Although it hasn't seemed to make a damn difference in the number of performances I receive, it helps me to organize my thoughts and state the methodology of my apparent madness. It gives me an opportunity to expose everyday facts as absurd while hinting at the success of an occasional artistic step forward in my work and that of others. Composing is a mixed bag, comprised mostly of boring and tedious tasks that few normal people have the patience for. But on some rare occasions there are indeterminate punctuations of improbable success that surprise even the most cynical and sceptical among us. I try to write about both types of events swirling around inside of my head: the mundane and the profound. On the mundane and more absurd side of life (the Circus side show), I received notice from one of the major composer conferences this Spring. It indicated that I was not accepted to the conference and that my work would not be performed. That's fine. I've got tough skin, and after three or four decades of applying, I know that persistence is the name of the game in this business. I'll keep applying in the future. But what caught my eye was the rejection letter that came. It was the standard typed letter they use every year. It always gets sent out with the same wording, but with dates changed. The printed text was photocopied leaving a blank space at the top to hand write in the last name of the composer immediately after "Dear Mr./Ms." Oddly, my notice of non-acceptance was addressed in the letter and on the envelope to Mr. Rice (That's not my name). Is Mr. Rice another unfortunate composer who's scores and paperwork got misplaced in the big pile? Who knows. Perhaps it was an administrative error, but the person who handles the administrative tasks for this not-for-profit organization earned a Harvard Ph.D. in Musicology. Perhaps I read too much into these mishaps, but the absurdest part of my personality thought it was strangely funny that after all of my years of applying, they still don't know who I am. On August 6th I wrote a post titled Apolkaypse Now. It mentioned that I was researching the Polka in anticipation of composing a modernist version. I use the term "research" broadly. Researching the Polka brought me to places I've never been. It took me into the world of Kiełbasa and Warkam Beer. It led me to the "Slovenian Style" and hundreds of YouTube videos of Frankie Yankovic (1915-1998). In case you didn't already know, Yankovic was America's Grammy award-winning Polka King. 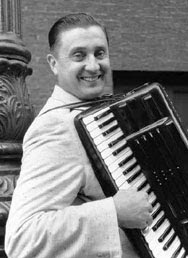 Here is a video of West Virginia-born Vankovic in his prime around 1960 singing the ever-popular"Hoop-Dee-Doo Polka." But the Polka haunted me. I kept thinking of a situation in the 1987 movie directed by John Hughes Planes, Trains & Automobiles. (Hughes died suddenly on August 6th at the age of 59). If you have seen the movie, you'll remember that there is a scene where the characters played by Steve Martin and John Candy hitch a ride in a truck with a Polka Band. Steve Martin and John Candy are opposites. In my warped mind they represent a Yin-Yang of artistic philosophy. I viewed that scene (then and now) in terms of Adorno's Hegelian-influenced post-Marxist aesthetic theory of a dialectics between opposing Dionysian and Apollonian ideals. The role played by Steve Martin represented the logical Apollonian tendency in art, while John Candy functioned as a symbolic representative of the Dionysian form of creative expression. Finding oneself imprisoned in the back of a moving truck travelling nowhere with members of a Polka band is a great metaphor for the complexity of compositional choice. It was a perplexing thought when I saw the movie in 1987, and it is still stands as a disturbingly perplexing conundrum to me today. Needless to say, all the Kiełbasa and Warkam beer in the world wouldn't be enough to transform me into a Polka King - not even a Polka Prince. I tried for weeks to immerse myself in Polka music, and failed miserably in any and all attempts to re-tool that rarefied musical form to fit into a modern-day modernist format. I just don't have Polka in my veins. Sorry folks, I failed at Polka, and failed miserably. But sometimes when you head off on a journey in one direction, you end up going somewhere else. It's like heading out for Brentwood, and ending up in Burbank. One of my attempts at composing a Polka morphed into a new work that even perplexes little old me. 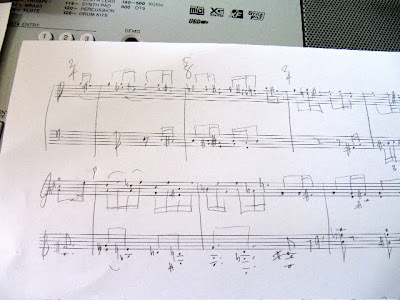 I ended up writing a set of hybrid tonal-atonal variations on the tune "Silent Night." It's Alban Berg meets 1940's Broadway. How I got there is beyond explanation, but apparently it is Xmas in July. And my latest piece (yet untitled) is a work for two flutes. I'm putting the finishing touches on it this week. Last evening I received an email from a composer who goes by the name of Davey but is known in some circles as the "Walter W. Naumburg Professor of Composition" at a University that was once lovingly referred to by Milton Babbitt as "an obscure music department in Waltham." Davey is also one of the three known semi-occasional readers of this blog. The email carried the subject line "Be very afraid" along with two file attachments. There was no accompanying text in the message. I overcame my concerns that it contained a virus, and opened the attached MIDI and PDF files in curiosity. What I found was a brand new work by this ingenious composer completed just days ago. It was a new Etude added to his mammoth collection of virtuosic works for the piano. The new piece is titled Polkritude - Etude #93. Listed underneath the title I noticed that the new work is dedicated to me (yep, yours truly). Feeling surprised, greatly honored, and rather "deconstructed," I launched the midi file in Windows media player and followed the music along with the PDF score. (I think the composer knows that I never progressed beyond "Chop Sticks" on the piano). It's a wonderful work, full of great humor and complex musical ideas. It successfully synthesizes the unlikely bedfellows of the 12-tone musical technique with the classic Polish-American Polka tradition. Both Dionysian and Apollonian ideals are realized. There is a note explaining "Dancing to this polka is not advised unless you have special shoes." Given the tempo and changing time signatures, this is good advice for anyone over 40. Thank you! I assume that while on vacation in Burlington VT you read my blog post "Apolkaypse Now" and found the idea of composing a modernist Polka to be an enticing challenge. It clearly can be done - although I was not able to make any headway on that project myself. But, you succeeded. My hat is off to you. Maybe a modernist Tarantella would be more in my bailiwick, but I think Luigi Dallapiccola may have beaten both of us to that game. 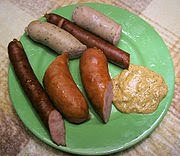 So folks, that's how composers make Kiełbasa. People who listen to and support new music are often confused and baffled by the selection of divergent musical styles and offerings presented in concert. For them , it's not an easy task to differentiate between various works and sort out the good from the bad. It necessitates that one sit through a dozen or more horrendous pieces to hopefully encounter a rare musical work that has potential and some merit. There is an unfortunate tendency to entrust the musical establishment with the bulk of this important task. The public is inclined to delegate the responsibility of musical selection to professionals and musical curators who create the initial playlist. With so much new and unexplored music out there and so little opportunity to hear it, it is easy to see why the "tell me what to like" approach has become an all too easy and convenient solution. In Massachusetts, summer new music festivals from Tanglewood to BangleWood (at MoCA) have adapted a tendency to program works by known composers who have an established a track record. If composer X or Y has attained many awards and distinctions, then the public's inclination is to assume that their music "must be good." Conversely, in the culture of new music, if a composer is obscure, rarely performed, and an unknown quantity, then there is uncertainty, suspicion and hesitation. "Why should I waste my time with that?" While a few of the composers who break through the glass ceiling of the new music establishment may be labeled as "emerging" or fresh voices, by in large musical organizations have a deeply ingrained self-interest to program middle-of-the-road works. By default, they play it safe. The business-side of their financially strapped not-for-profit organizations are risk-adverse and opt to ride on the bandwagon of this or that composer's success. The bandwagon phenomenon actually works both ways. Not only do the music festival directors have a motivation to gravitate toward the mainstream, but the more successful a composer gets, the more accessible their music is likely to become. Both composers and music festivals trend toward serving the least common denominator in the interest of attaining a larger audience. Consciously or unconsciously, they increasingly provide what the majority of people want to hear rather than take a chance on unexplored, unheard, or unimagined minority points of view. I think the current selection system creates a false and artificial relationship between the composer and the public. It is driven not by a quest for new and innovative music, but arises haphazardly as a compromise of self-interests between a hodgepodge of groups involved in the selection process. The result is that "established" composers monopolize the stage, take-on less risk, and simply rewrite pieces that worked for them in the past. They fall into the trap of appeasing their audience with what they want to hear rather than what they as artists would like to explore, discover, and create for themselves musically. They loose their cutting edge. I can name so many composers who were hot commodities early on in their career 30 years ago. Some of them won countless prestigious awards, such as the Rome Prize and fellowships from the Guggenheim Foundation. These composers had a plethora of performances by leading musical organizations, and released commercial CDs of their music - all to good reviews. Today those composers have completely disappeared into a dark void. For whatever reason they lost interest and simply gave up writing music despite the impressive initial volley of their formative years. Today, by all accounts, these composers no longer compose music. What happened? Why did these composers not live up to high expectations? After all, they had made it past the all-important filter of success maintained by the new music establishment. It's a difficult problem to analyse, since a few of these composers in my view were indeed extraordinarily talented (although most of them were competent, but ordinary). I can't speak for them, but my read is that these individuals lost sight of what composing is about. They got so wrapped up in playing the game of winning awards and getting ahead in their careers that they forgot what attracted them to music in the first place. Perhaps after attaining recognition from the musical establishment these composers realized that in the large scheme of life awards are a hollow. Attaining badges of superficial distinction may be good for bios in concert program booklets, but little else. The musical establishment perpetuates itself by selecting (more or less randomly) young composers from a pool of fresh talent. Musical artists and composers alike participate in the open marketplace by presenting their wares to professional organizations and concert promoters. But clearly it's a buyer's market. A lot of good fruit gets left on the shelf unsold and wasted. It's an ugly system. Sometimes good musicians and composers are damaged by the outcome. Not only are too many talented people overlooked, but a percentage of those who have initial success spiral down, crash, and burnout after they realize that the system that created their success is arbitrary, indiscriminate, and superficial. It is clear to me that the music that is selected for us to hear at music festivals and concerts is unevenly distributed. The selection-process comes from the inside rather than from the outside. It's about relationships, personal alliances, notoriety and fat bios. It's about political correctness and political influence. Given the amount of new music being produced today, there probably does need to be some method of filtration. The current belief is that filtering is a matter of practical necessity: too many composers, and too few resources result in not enough opportunity to hear everyone's work. But, if that is truly the rationale behind the established system of elimination, then why is it that a minority of composers rise to the top of the heap? Look around, and it is clear that certain composers are performed all the time. Conversely, some composers are rarely, if ever, performed at all. I believe that the current system of music selection at new music venues is imperfect and mildly corrupt. "Pay for play" is more common that the public is led to believe. Deal making of all sorts occurs as well. The selection system doesn't work as it should and as a consequence the public is left short changed. Listeners are not exposed to a fair and representative offering of musical ideas that truly stem from the broad and rich landscape of current musical expression. As a result, the public may be missing out on the "next great thing." The fact that the current offering of performances of musical works is unevenly distributed frustrates me as a consumer and as a composer. I don't necessarily believe that we are hearing everything that is out there. I don't have faith that what is being marketed, packaged, sold, and delivered by the musical establishment is the best of the best. The system seems to be anything but fair, efficient, and equitable, but it's the only mechanism we have. At least for now. Short blog post today. It's mucho hot and humid. It occurred to me that I am most receptive listening to music in the evening - sometimes the late, late evening. It also occurred to that concerts tend to be at night. This made me wonder if the social bonding and community building function of music has a ritualistic association to peoples' universal need for protection from darkness. It is as if music is empowered with magical properties that can ward off monsters lurking in the night. While today the chances of getting malled by a wild boar at Symphony Hall are rather remote, the modern human psyche still finds comfort and solace in the sound of music when the creepy crawlies have been known to come out. Loud music scares away wild animals, particularly loud contemporary music (e.g. George Crumb's electronic string quartet from 1970, "Black Angels"). 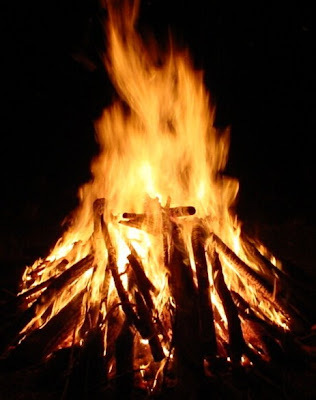 Singing or listening to songs while standing around the campfire is an example of the musical magic show. Composers and musicians provide the appropriate mood music to quell fears in humans, and it also seems to have the effect of scaring away the coyotes, tigers, and bears. Over the eons the composer-magician has developed standard tricks to maximize the psychological impact of their craft. Music making has developed into highly refined sound rituals with broad social ramifications. The profession of composer is not unlike the profession of magician, shaman, or witch doctor. As long as humans have an innate fear of the dark and believe the music can provide comfort, protection, or solace, then composers will have a purpose. Roasted marshmallows or s'mores anyone? Vincent Persichetti (1915-1987) was a distinguished Italian-American composer, teacher, and pianist from Philadelphia (photo top left). He composed nine symphonies, chamber compositions, twelve piano and harpsichord sonatas, songs, choral works, pieces for band, a series of really cool and oft-performed solo works called Parables, and an opera. He taught at the the Juilliard School for four decades beginning in 1947. In 1963 Persichetti was appointed chairman of Juilliard's world-class composition department. I met Persichetti when I attended Juilliard as an Extension School student in 1972-73. He allowed me to sit in on his weekly composition colloquium which featured a wide spectrum of visiting composers who lived in or happened to be passing through NYC (I recall George Rochberg, Otto Lunning, Charles Dodge, to name a few). 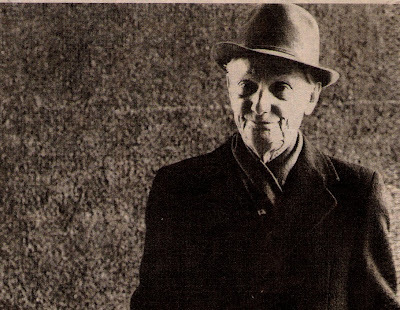 Vincent Persichetti was a good composer and a well-respected teacher. It is said that he could modify a few notes in a student's score, add a few accents here and there, and presto, the student's music would be transformed into neo-classic Stravinsky. I still have Percichetti's book "Twentieth Century Harmony" and browse through it from time to time. The big news in 1972 was that Richard M. Nixon (photo on top right) was reelected to a second term as President of the United States. His Presidential Inaugural Committee looked around for a composer to commission a work to perform at Nixon's second Inaugural Concert scheduled for January 19th, 1973. The new piece would be performed by the Philadelphia Orchestra. Since Persichetti was a distinguished American composer with a long-standing history with the Philadelphia Orchestra, they selected him for the honored commission. The result was a cantata titled "A Lincoln Portrait" op.124. Persichetti completed it in 1972. I remember this well, because I was taking a music copying class at Juilliard with Arnold Arnstein, the famous music copyist for all the big-name composers of the day. Arnstein's staff at his pricey West Side studio had been working on the parts for "A Lincoln Portrait" in anticipation of the high-profile premiere in Washington D.C.
One day in January of 1973 we got news from the front page of the NY Times that the White House was pissed. 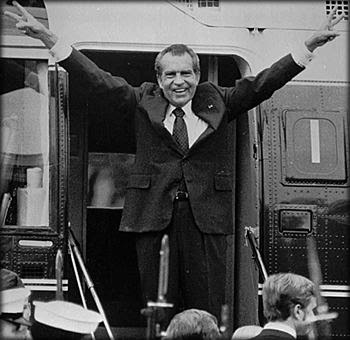 Nixon didn't like certain passages of the text Persichetti had selected from Abraham Lincoln. He thought it would be construed as antiwar. In particular it was Lincoln's reference to the Civil War where he described it as a ''mighty scourge'' that offended President Nixon to most. The reference hit too close to home, since the country was still deeply engulfed in the horrors of the Vietnam War. Persichetti did not want to retract the text or revise his work under political pressure, so the White House withdrew "A Lincoln Portrait" from the Inaugural concert program. Not surprisingly, other orchestras rushed to perform the work in its' original version. The work received its' much anticipated premiere later that month by the St. Louis Symphony conducted by Walter Susskind. The White House snub had turned into a marketing bonanza for the relatively obscure contemporary American composer. It was a big moment. I often wonder what it is that musicologists do. They appear to have monopolized many college and university music departments, and never seem to run out of rhetoric regarding a form of expression that is essentially non-verbal. Their banter is harmless most of the time, and easy to ignore if you avoid their academic circles, professional journals, and musicological conventions. For the most part, the profession of musicology is rather benign and usually confined to tiny enclaves hidden within academia that have little or no relation to the reality of music making. Generally, I pay little or no attention to it. They don’t bother me, and I don’t bother them. But when the profession of musicology lets a pit-bull out of the kennel to roam in public areas, I get very perturbed. One of musicology’s shining lights – let’s call him Mr. T – is a wild animal with rabies on the loose. He frequently goes on the attack in mainstream newspapers (such as the NY Times) to condemn styles of music that his paranoid mind sees as evil. Mr. T, a sharp-tongued academic, is highly skilled in the art of verbal destruction. He wields his pen like a knife, even if his underline point of view is baseless, distorted, and malformed. When discussing styles of music he does not understand, his message is usually one of intense rage and blind hatred. From my perspective, Mr. T is the Ann Coulter of musicology. I call him Mr. T, because quite frankly I fear him. He is a dangerous person, and I don’t want myself or my family to be tracked down by this wack-job. Frankly, based on his past actions, I wouldn’t put anything past him. One of the ugliest street fights I’ve ever seen in this business was instigated by Mr. T. In March of 1996 he wrote an article for the NY Times where, from out of the blue, he torpedoed an innocent victim just for the fun of it. Masquerading as a review of some music CDs, it was in fact a cold-blooded assignation. I am not exaggerating my case.His despicable article provoked an enormous public outcry and resulted in a deluge of letters to the editor from an outraged public. Not only was a talented composer’s career being destroyed, but a large number of other composers felt as if our entire profession was being maligned. One can only imagine what it must have felt like to be the innocent composer that Mr. T selected to publicly execute in his NY Times CD review. Mr. T, who thinks like a stalker, selects his victims when they least expect it and are most vulnerable. The victim of his vicious assault in 1996 was an ordinary guy, a composer working in his basement studio like a craftsman slaving hard every day to write his personalized and well-made musical compositions. He was 65 years old at the time, in poor health, and like all composers, just trying to get his music heard. Albany Records had just released two CDs of his work. One CD was of his solo piano music, and the other a reissue of a 1974 Nonesuch LP recording that had gone out of print. I happened to purchase the CDs. I think it's wonderful music, but that is besides the point. One would think that a CD release would be reason for anyone to celebrate. In a market deluged with new CDs, even getting a mention in an influential paper such as the NY Time would help to generate a few sales. Nobody gets rich from writing, publishing, and releasing CDs of contemporary music. It’s a niche business. The more music that is out there, the more people are exposed to it, the more options everyone has. If someone dislikes it, that’s OK. No one is forcing them to purchase the CD. It’s a free country. When the attack in the NY Times came, it was lethal. Mr. T’s choice of words were toxic, and he made no attempt to hide the fact that his motivation was to destroy the composer’s credibility and career. He went directly for the jugular. Journalistically, I’m not sure this article, which is full of innuendo and character assignation, would have made it past editors in the UK where writers can not hide behind first amendment rights for legal protection. Anywhere else but here in the US, Mr. T would have been sued. The impact of this ridiculous NY Times article was formative. Mr. T had made a name for himself, but the composer he knifed repeatedly in the back alley was devastated. I would go as far to say that the psychological impact experienced by the composer being dragged through the mud by this wack-job shortened his life. Nobody unfortunate enough to live through vile public criticism such as this can emerge undamaged. Having the misfortune to receive such unscrupulous criticism can only be devastating to one’s soul, and one’s physical health. All of this would be past history, water under the bridge from an ugly incident that occurred over 15 years ago. The composer who was attacked has since died, and Mr. T has advanced his career as a much published and much feared musicologist and academic. He is chair of the music department at a leading American university. Regrettably, the old the wounds have been reopened once again. Earlier this year Mr. T published a volume of his essays (“The Danger of Music”), which include the infamous 1993 NY Times article that caused so much turmoil and emotional distress. Not only does this revisit a crime scene that most of us have tried to put out of our minds and forget, but to add insult to injury Mr. T adds a lengthy postscript to his article. Like Dr. Schön in Alban Berg’s opera Lulu, Mr. T coldly digs his knife into the victim once again, going deeper this time. He turns the knife from side to side - even though the victim is no longer alive to defend himself. It’s the epitome of cruelty. 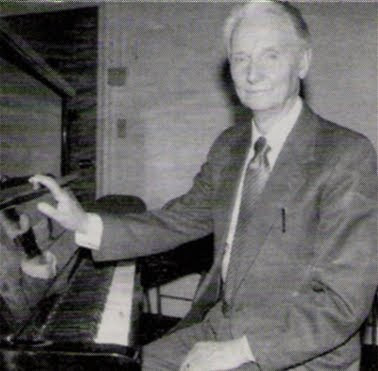 That’s why musicology makes me ill.
Jeronimas Kačinskas (1907 -2005) was a distinguished teacher of mine at the Berklee College of Music in the early 1970s were he taught conducting and music composition. He was a member of the Berklee faculty from 1967 to 1986. He was a quiet, unpretentious, and frail looking man who spoke good English in a soft voice. Yet, everyone in our department admired him for his musical skills, talent, and experience. Students and faculty alike held him in high esteem, and to this day I remain in awe of his many accomplishments. Yet, despite his profound musical abilities and distinguished reputation in Eastern Europe, he remained highly obscure for the majority of his life in America, and lived quietly in the Lithuanian community of South Boston with his wife of 64 years, Elena (Šlevaitė). But to the Boston musical community at large, he was a virtually unknown entity to them, and that was an injustice. Kačinskas was born in Viduklė Lithuania on April 17th, 1907. His father was a church organist. He went on to study at the National Conservatory of Lithuania in Klaipėda and then at the Prague Conservatory in Czechoslovakia where he received his degree in 1929. He studied conducting, piano, composition, and viola. Soon after he joined the faculty at the Vilnius State Conservatory and his career as a composer and conductor flourished. His composition teacher was Alois Hába (1893-1973), a Czech composer and music theorist who worked in microtones. Hába commissioned quarter-tone and sixth-tone instruments such as trumpets, clarinets and pianos, and Kačinskas acquired one of these pianos and began composing in the microtonal pitch system. I remember Kačinskas talking about the microtonal orchestra he had created with his teacher and other associates. Hába also influenced Kačinskas with his concept of "athematic music." Since "nothing in nature and the human life is recurrent, therefore music has also to be written according to the principals of non-recurrence." Kačinskas adapted modernist ideals, and was an early champion of new music in Lithuania. 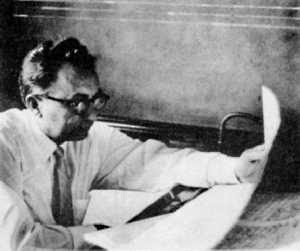 As a composer, Kačinskas gained international recognition in June of 1938 when his "Nonet" (1932) for flute, oboe, clarinet, bassoon, horn, violin, viola, cello and double bass was premiered at the I.S.C.M. (International Society for Contemporary Music) Festival in London. His work was performed along side compositions by Darius Milhaud, Vitezslava Kapralova (a talented but little known woman Czech composer/conductor), Aaron Copland, Viktor Ullmann (who would perish at Auschwitz in 1944), Karl Amadeus Hartmann, Peggy Glanville-Hicks, Anton Webern, and Béla Bartók. (Wow. That must have been an interesting crowd to hang out with at the London Pubs). It is said that Kačinskas' "Nonet" was written in a style that is somewhat similar to the music of the Hungarian composer Béla Bartók. Kačinskas and I would talk about Bartók alot, and apparently the two men had mutual respect for each other after meeting in London. When pressed, Kačinskas would concede that Bartók's music occasionally degenerates into whimsical silliness - a trait that neither of us found compelling in Bartók's generally masterful work. His reputation as a conductor in his native country was blossoming. By 1944 he had conducted 1,000 concerts with the Vilnius Philharmonic Orchestra and Vilnius State opera. All was going well, at least until WWII extended into the Baltics and Stalin took control of Lithuania. "We spent one year under Stalin and it was very harsh. One of my wife's brothers was shot, another was sent off to Siberia. The Russians had forbidden my composition to be played after the state declared them bourgeois and decadent. I became outspoken and perhaps too provocative towards them because I felt so strongly that they should not interfere with my work." "I put a few necessities and what was left of my manuscripts, concert programs, and reviews into a horse-drawn farm cart, and we left. We managed to get about 250 miles from Vilnius, avoiding encirclements on three separate occasions. Finally we were caught in the middle of a battle and had to abandon the cart in the road. At that point my only thought was to save my wife's life. I don't know what happened to my music. I'll probably never know whether it was picked up or thrown away." [the except above is from an interview with Kačinskas in Berklee Today, Spring 2002 issue]. In 1944 Kačinskas and his wife escaped Lithuania by travelling 600 miles on foot and by horse-drawn carriage through Poland and eventually on into war-torn Germany. The ardours and dangerous exodus took several months. Not only was forced to leave the majority of his musical compositions, but his rare microtonal piano had to be left behind. In Augsburg, Germany he and his wife were rescued by American troops and placed in a refugee camp. Not wanting to remain idle, Kačinskas organized war-time and post-war concerts. He guest conducted at Ludwigsbouw Hall with the Ausburg Orchestra, with the Prague Radio Symphony, and with the Duborknick Symphony Orchestra in Yugoslavia. In 1949, the couple emigrated to the United States, and Kačinskas returned to his roots as a church organist at St. Peter Lithuanian Parish in South Boston where was also engaged as a choirmaster and composer of religious music. In 1967 he joined the faculty of the Berklee School of Music (which until 1960 was called the Shillinger Institute of Music), where some of his colleagues on the faculty informally referred to him as "Jerry." As a teacher I found "Mr. Kačinskas" to be pretty easy going. I recall working a Schoenberg-influenced piano sonata, and he would play through it but have little to comment on. We both seemed to believe, like Bartók (who took no composition students on ethical grounds), that teaching music composition is an impossible task. Yet we had many interesting conversations about music. One discussion over coffee in the student lounge that sticks out in my memory is regarding the first movement of Beethoven's 5th Symphony. It's so damn short! But in those few minutes, a lot of ground is covered. Both of us reveled in that fact. His teaching of conducting technique was much more rigorous. He would sit at the piano and respond as an orchestra would as individual members of the class took turns conducting musical excerpts with our batons. Kačinskas would start us off with the Bach Chorales, drilling us on the tricky execution of fermatas at different locations within the measure. He showed us how to negotiate all kinds of conducting problems, including operatic recitative - which has a fluid tempo that is out of the conductor's direct control. He explained that the orchestra needs to have the "empty" beats and measures communicated to them, but it is traditionally done in a cool, calm, and collected manner, without any unnecessary emotion. Outside of a concert of his music put on by Berklee in 1991 (five years after his retirement), I don't believe that Kačinskas had any of his major pieces performed in Boston, or elsewhere in the United States for that matter. After coming to America he had dedicated his life to teaching, and avoided the mainstream Boston contemporary music scene altogether. I remember writing a letter to the then music critic of the Boston Globe suggesting that he investigate Kačinskas' music. Unfortunately, there were never any concerts to review. However, before his death at the age of 98 from cancer, he was invited back to Lithuania for one last visit. In 1991 he was awarded the Lithuanian National Prize. The award is granted for achievements in culture and the arts. 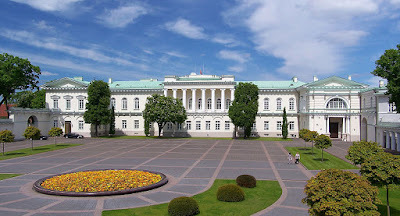 The prize is formally bestowed every February 16th when the decorations and diplomas are presented to the laureates at Presidential Palace in Vilnius. I would have loved to been there to see him receive his award. 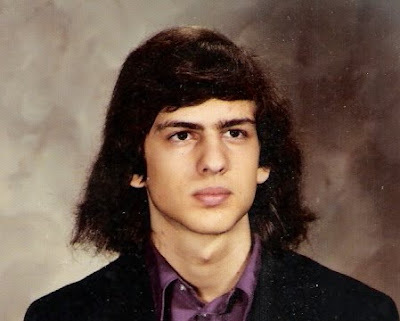 I looked for some photos to illustrate what I looked like in 1969, and the best I could come up with were the following two. Both of these photos would have been taken a year or two after I attended Woodstock. The first is from a musical jam session with a circle of friends at the Blanck's house on Maple Street. I appear to be playing a F major bar-chord on Christine's Goya folk guitar. The second photo is my official High School senior portrait. By that time I was was already listening to Arnold Schoenberg and Elliott Carter in addition to Hendrix and Zappa. I had been musically corrupted, and it was downhill from there. Before cellphones became so ubiquitous, keeping a pocket full of change was a good idea, just in case you needed to call home to ask for a ride. Communications while traveling internationally was also an adventure, especially in Italy where the telecommunications infrastructure was at one time pretty horrendous. It was operated by the PTT, a state-run Italian government service. I've heard that the wait for Italians to get a telephone installed in their home could take years. It was also primitive beyond belief. For example, every time I called a friend in Rome from the US in the early 1980s, the line was "busy." As a result, I just kept calling him over and over again with the same result for days. When I finally got through, he explained that he had been away, but that his phone system was a "party line" which usually results in a busy signal for incoming calls. It was also expensive. Making international phone calls of any kind was a real luxury. It is said that even into the early 1990s (according to Corriere della Sera), only 52 percent of all telephone calls originating in Italy would reach their intended destination. The NY Times reported that, "Many calls that do get through are suddenly cut off, or, more commonly, the connection sounds as though the person on the other end is crinkling an empty potato-chips bag against the mouthpiece." You would often hear other people's conversations, which was often entertaining until you realize that others may have been listening in to your conversation as well. The first option was to locate an available public phone booth. They were hard to come by, and ususuly occupied by long-winded and animated rambling Italians. This method also require that you pre-purchase a large supply of Gettone Telefonico tokens needed to insert in the telephone, and have all the appropriate country codes and numbers ready to dial. Phone cards weren't invented yet. 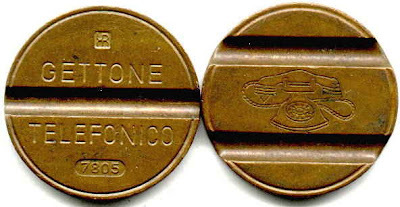 The Gettone was a copper token, and it was used in Italy from about 1959 to 2001 (I was in Italy in 1984). The price changed over time, but it was roughly equivalent to about 200 Lire (or 18 cents) at one time. Some people used Gettone as legal currency - small change. There is actually a way to read the number at the bottom of the token (#7805 in the photo above). This Gettone was minted in May (05) of 1978. The payphone option never worked well for me, since I could barely feed the phone fast enough with Gettone to keep from being disconnected. The service was very unreliable and intermittent. The other option for making a call was to go down to the Central Office of the PTT. This was always a dreaded encounter of the worst sort with an indifferent Italian government bureaucracy. Only the Italian Post Office could come close to rivaling the poor-customer service your would get at the PTT (in fact a division of the Post Office). In Florence in 1984 the Central Office of the PTT was grey, dark, and dreary. As you entered the room you were greeted by a long line of 100 or so people who were all waiting like cattle for their turn at one of the dozen or so individual phone booths. A fat balding man wearing a fascistic uniform and a big hat sat at a central console and collected money from people who had just made their telephone calls. He looked at a meter hidden from public view in his tall desk, and then demanded a fee from you in Italian. It had to be paid. Other fascistic-looking PTT personnel stood idly by doing nothing other than made occasional cryptic comments among themselves while doing their best to look menacing. Boredom was the order of the day. No one ever smiled. People stood in line, grim faced, waiting for their opportunity to call a dear friend, ill family member, or lover. A customer could make only one call at a time, but often appeared monopolize the "cabina telefonica" for extended periods of time. The Central Office was open day and night, around the clock. In some ways it resembled a busy train station with lots of tired poor people in search of something. Occasionally folks would leave their phone booth in tears after speaking to their loved ones. On one day, I had walked a long distance to get to the Firenze Central PTT Office. It was cold and raining. The line was rather long, so I had to wait (standing up) for at least an hour and a half. I finally got my turn in a phone booth, and dialed my parents who were almost always at home. It rang once, and then the circuit disconnected. I heard a loud click that resounded as if someone was picking up a phone on another line. Angry, I stomped out of the phone booth and began to walk for the door. I had assumed, no connection, no payment. That's they way it works in America. Same thing here in Italy, right? The fascistic-looking bureaucrat at the PTT desk yelled out at me and waved his arms around in anger. He realized that I was a tourist, but was all too willing to call his guard dogs on me for avoidance of payment. I walked up to his high podium and tried to plead my case in my terrible Italian, which had the impact of sending him and his cronies into a state of uncontrollable sadistic laughter. It must have been the most entertaining thing to happen to them all day. But I realized that the only way I was going to leave that building without getting arrested was to pay thousands of Lire, whatever fee the big man deemed appropriate. He looked and acted like "Il Duce." I paid my fee, left the mausoleumish PTT building, and lived to tell this story.